Summer is here and the open road is calling. Get inspired with these DIY ideas for globes and paper crafts for maps. Even if a vacation is not on the agenda you will feel like you’ve seen the world after making a few of these clever travel themed crafts. 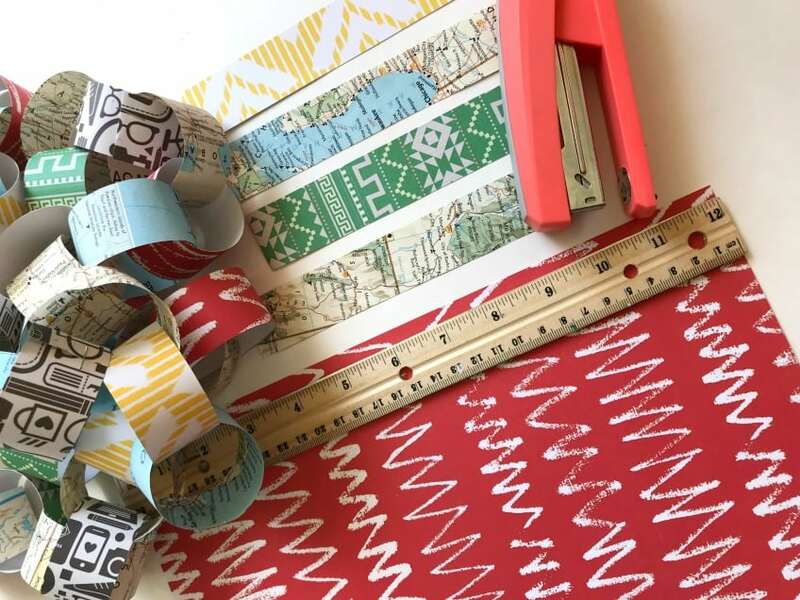 Easy paper chains made with vintage maps and up-cycled globe ideas will have you inspired to book a flight or maybe just try a backyard camp out. 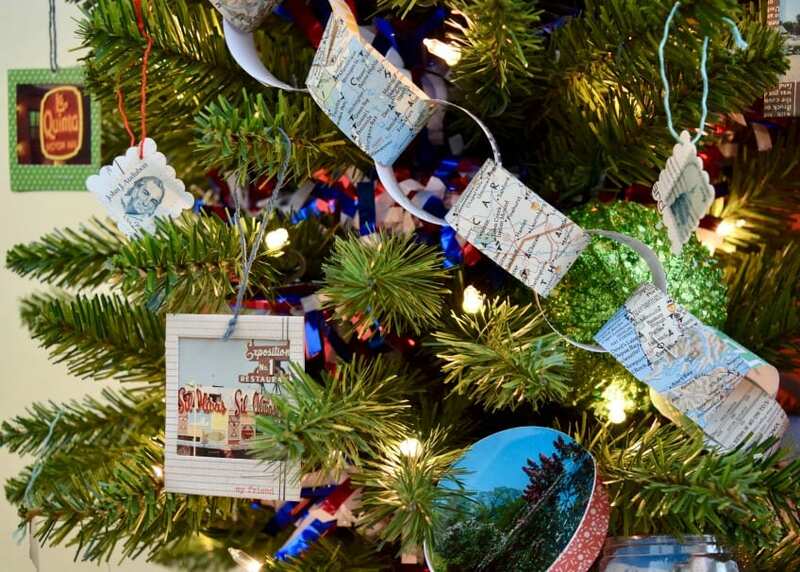 I recently shared the Summer Spree Tree I decorated and my DIY snow globe ornaments – well these fun map paper chains were another one of my favorite travel themed decorations. With apps and phones telling you were to go paper maps are a bit antiquated. Plus with vintage maps they are sometimes no longer correct. Enter DIY paper chain garlands, the perfect up-cyle project for vintage maps. Paper chains could not be an easier craft to make. After you cut the strips, put the littles to work because this also doubles as a great summer kids craft project. Step 1 – cut strips from old maps and scrapbook paper. I used THIS PAPER PAD. Step 2 – Once you have a ton of paper strips bend into a circle and staple. Take the next paper strip and do the same but looping it through the circle you just made first. Step 3 – Keep on keeping on making your vintage map paper chain. TIP: When decorating a Christmas tree with a paper chain I found it best to make several shorter chains in varying lengths 1ft, 2 ft, 3ft rather than one big chain. 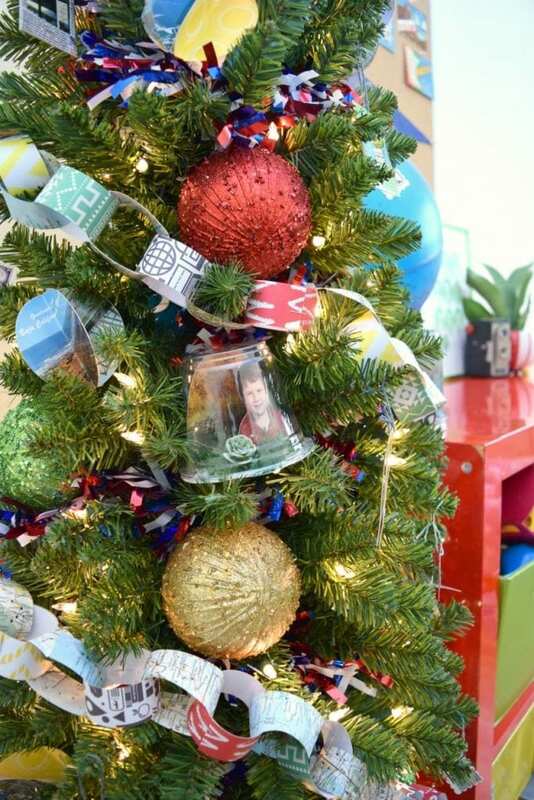 You don’t need to decorate the back of the tree so why waste paper. Look at all that travel themed cuteness. I can’t decide what part I love the most: DIY snow globes, vintage motel postcards or the recycled map paper chain. Which one is your favorite? 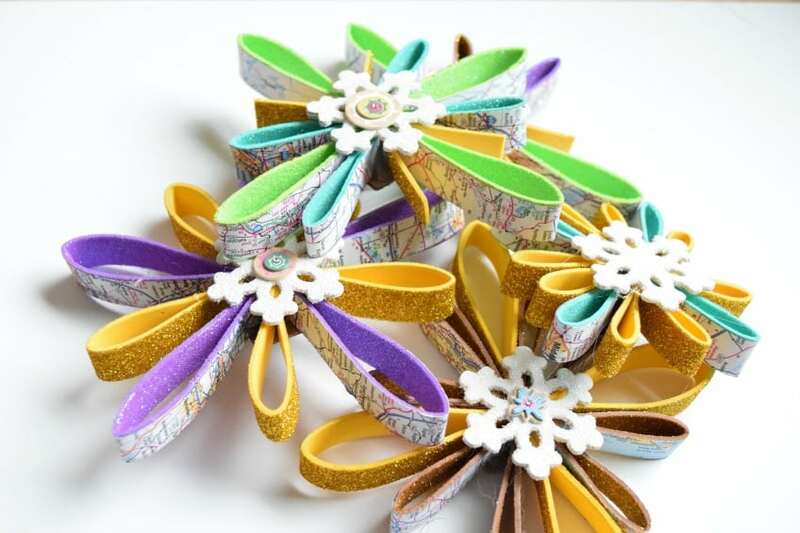 If you are feeling extra sassy maybe you could try combing this vintage map paper craft with this photo strip paper chain project. Maps + photos = awesomeness! As promised I’ve got a couple of other ideas for DIY globe projects and more vintage map up-cyles. Keep reading! 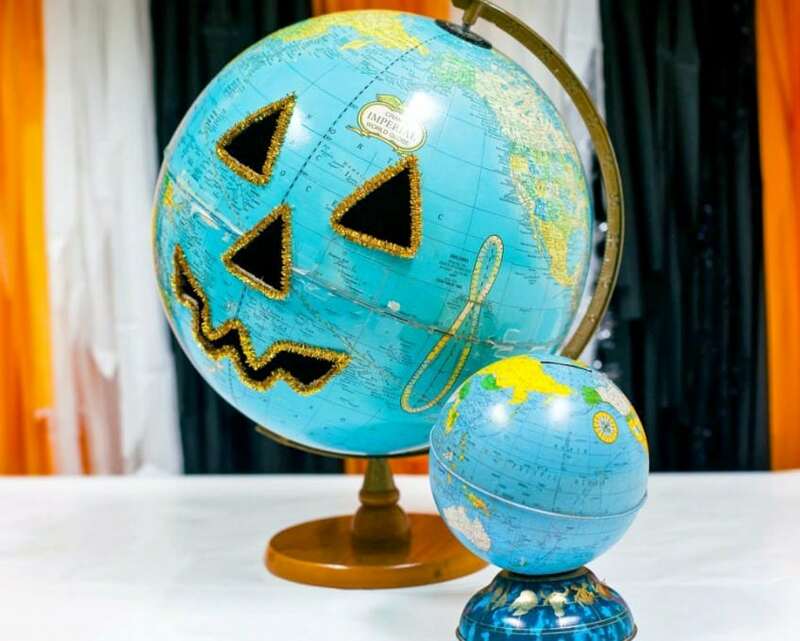 Get bit by the travel bug all year long, even in October with this Jack-o-lantern globe. The Teal Pumpkin Project is something I am extra passionate about since my son has a peanut allergy. Check out 10 DIY Ideas for Crafting the Perfect Teal Pumpkin This Halloween for TONS of ideas including my carved globe. Are you a snowbird – as in like to travel somewhere warm when it is cold outside? Maybe you aspire to be a snowbird when you grow up. I know I do. These DIY map snowflakes will keep you thinking warm travel thoughts all winter long. What have you made with a map or globe recently? I’m always interested to hear about other fabulous ideas and suggestions. Posted August 7, 2018 & filed under Christmas, Crafts, Holidays, Paper Crafts. What great ideas. I have an old globe that I took apart to do something with it. I didn’t make it. I may have to do the pumpkin idea. So cute. Thanks for sharing at Snickerdoodle Create Bake Make.